Have you experienced a burst pipe in your San Antonio home or office? Act quickly! Water damage from burst pipes can get very expensive the longer you wait. First, shut off your water. Then call Complete Clean Water Extraction. The faster your response, the lower your chances of devastating water damage sustained. Complete Clean Water Extraction has been restoring properties that have water damage due to ruptured pipes in San Antonio since 2003. Our crews take pride in speedy response times and will quickly contain the damage and restore your property. Burst Pipe in San Antonio, Texas? If a pipe has burst in your building, call the restoration experts at Complete Clean Water Extraction today. We have been repairing burst pipes in San Antonio since 2003 and ready to assist you as well. When you call (210) 239-0486 for a free quote to fix your ruptured pipe damage, you'll receive prompt, professional service and a free written quote. The longer it takes to contain the leaking water, the greater the water damage. 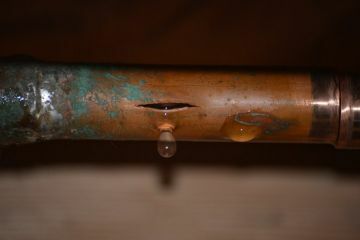 Call Complete Clean Water Extraction ASAP to fix your burst pipes! Timing is critical! You need a restoration company that will arrive quickly address the problem. If you have experienced a pipe rupture, first turn off your water supply, then call (210) 239-0486 for a speedy response and sound solution. We’ll find the source of the broken pipe and determine the extent of the damage sustained. Next, any necessary repairs or replacements will be made. Then, we'll restore any water damaged areas to their original condition. When you call Complete Clean Water Extraction you'll receive complete restoration service to fully recover your property. Aging, Corroded Pipes in San Antonio? Pipes can burst from freezing temperatures or clogging caused over time. Contaminants and mineral deposits cling to the insides of pipes, narrowing them obstructing the flow of water. When pipes become clogged, pressure increases until eventually the pipes leak or rupture, spewing water in your flooring, walls, and possessions. If you’ve experienced a burst pipe, first turn off your water. Then call Complete Clean Water Extraction at (210) 239-0486 for fast action to fix the problem and restore your property. We’ll determine the source of the problem, and identify other pipes that may be compromised. Portions of the pipe will be replaced as needed. Last, any water damage sustained will be remedied. 5★★★★★ - "Complete Clean is extremely knowledgeable with reasonable rates and quick services for water damage. The work speaks volumes for the company." 5★★★★★ - "This company is a class act. They cleaned my tile floors with meticulous care, leaving them in like new condition. The workman were professional and truly wanted to do an excellent job to my satisfaction. Highly recommended." 5★★★★★ - "I wish I could give Eric Argueta, Complete Clean 100 Stars. They are an awesome company. They do not haggle you to get over the top services you don't want or need. I called him late on Friday and asked him to come out early on Saturday. He was so generous and kind to oblige my request. My carpet looked like mud, but when his crew finished they looked like brand new carpets. I can truly guarantee that you will be 100% satisfied with Carpet Clean. Eric thank you!!! You Rock!!!" 5★★★★★ - "Plastic pipe connection in the wall for the refrigerator water line cracked so we had a steady geyser of water flowing in the kitchen, kitchen pantry, and master bedroom closet (shares a wall with the kitchen). Found Complete Clean via Google search and called early in the morning the next day (after the plumber repaired the leak) and spoke to Eric the owner who said he and another employee could be at our house in less than 1 hour. Eric was so sympathetic to our plight (plumber and carpet restoration cost was less than our insurance deductible so we were paying for everything), that he included 2 additional blowers at no cost (after we agreed to pay for 2 blowers and a dehumidifier to be used in the master bedroom closet, carpeting/padding, and dry wall) for the dry wall behind the refrigerator and pantry dry wall. Eric also allowed all of the equipment to remain on our property for 2 additional days (e.g., over the weekend) for free." 5★★★★★ - "Very professional, fast and friendly I will call them again and I do recommend them!! My carpet has not look like this since the first day I moved in my home. Thank you guys!" ★★★★★ - "The San Antonio hail storm caused damage across the city - Knowing there was a lot of damage, I was really worried that I could get help quickly, but was fortunate that I called Complete Clean - Eric came to the house right away & we had the carpet & pad pulled up with driers going in less than 2 hours from the time I called. I am a realtor and always am asked for referrals from my clients......Eric will always be #1 on my list for all the services he provides! " 5★★★★★ - "We called Complete Clean to come out to a bad bleach spot that was caused by my one of my kids I try to work on it myself but cannot get it to match so we call to see but there was anything that can be done Eric came out at no cost and give me a free estimate and assured me that he could take care of the problem I was kinda skeptical at first because we had a previous carpet repair company do some work in one of our other houses and the repair look worse than the actual problem we had to make this look like nothing ever happened because we did not want to have to replace the carpet and entire upstairs since we were movin out in a couple of months complete clean made the repair very hard to see, the only reason we were able to even notice it because when you it what's there thanks Eric for saving us a thousands on not having to replace the up stairs carpet will definitely recommend them." 5★★★★★ - "We have all white carpet that hadn't been cleaned in over 10 years and it showed it. We were going to replace the carpet after this year but when Eric with Complete Clean got through with it it was almost as good as new my husband was really surprised he thought I was just wasting my money but now he is happy that he can save thousands by not having to replace the carpet and making me happy at the same time. Thanks Eric." "I have a couple rescue dogs that go in and out constantly so you can imagine how my carpets get and to mention the doggy accidents. But thanks to Complete Clean my carpets stay fresh and clean longer, I love that I don't have to worry about stains coming back and with the application of no residue rinse my carpets stay clean much longer." 5★★★★★ - "I woke up to 2 inches of water in my house in the middle of the night didn't know who to call I went online and called Complete Clean. I chose them because I was able to talk to live person and not a recording like the previous companies I called. They arrived at my house with-in 20 minutes and were really patience with me and answered all my questions they really made my all concerns their concerns. They helped make that rough night alot easier and walked me throughout the whole water damage remediation process from start to finish. I loved that they were able to bill and work with my insurance company directly which gave me one less thing to worry about which was important to me when going through a ordeal like that. Thanks Eric with Complete Clean." 5★★★★★ - "Awesome! I thought I had ruined my brand new hardwood floors with poor commercial wax. They showed up on time and got straight to work stripping it all off without damaging the wood. Floors look as good as new! Would definitely hire them again for my tile and carpet as well!" 5★★★★★ - "Eric was able to stretch the carpets for me the day I called. He was prompt, professional, and very fair. I highly recommend Complete Clean." 5★★★★★ - "I have a pup that made a hole in the carpet in the middle of the room. I thought that at best l could patch it and it would not be noticeable, but Eric Argueta really did a wonderful job! am very pleased with his work and could not even tell where the ripped carpet was. I called this company based on reviews, that's why I give this job a 5/5. I wish I could post the pictures, it was just amazing, like nothing ever happened!" 5 ★★★★★ - "Awesome work." 5★★★★★ - "Complete Clean Restoration continues to impress! I can't say enough about the work Eric does - the BEST company we have used for carpet cleaning both personally and as Realtors. Eric is a master at stain removal & our light-colored carpet. Complete Clean Restoration continues to impress! I can't say enough about the work Eric does - the BEST company we have used for carpet cleaning both personally and as Realtors. Eric is a master at stain removal & our light-colored carpet looks brand new after he cleans it - like magic! Recently we had a water leak that effected our bedroom carpet. Eric came promptly with his fans, dehumidifier, and now we are back to normal with fresh, clean carpet. Complete Clean Restoration is extremely professional - prompt, courteous, incredible results and attention to detail. We appreciate that Eric respects our home by placing corner guards on all our furniture & he takes the time to listen & do the job right. Our highest recommendation & we'll continue to refer all our family, friends & clients!!" 5★★★★★ - "I've been utilizing Complete Restoration's carpet cleaning services for years! Eric and his team are always punctual, professional, and friendly. They do an amazing job with my carpets and I will never use any other carpet cleaners again. I've been utilizing Complete Restoration's carpet cleaning services for years! Eric and his team are always punctual, professional, and friendly. They do an amazing job with my carpets and I will never use any other carpet cleaners again. You definitely get your money's worth and carpet looks brand new every time!!" 5 ★★★★★ - "I am very pleased with the service provided. Eric responded promptly to the needed repairs with efficiency and professionalism. Technician was on time and did exactly what we requested at the price quoted. Our company will definitely be doing business here again!" ★★★★★ - "Eric and Joel could not have been better to work with. I received calls and texts letting me know when they would arrive. They arrived on time and helped work around other workers in the house. They were extremely fast and efficient in completing the job stretching the carpet in my new home. I felt comfortable working with them and would recommend them to anybody." 5★★★★★ - "On behalf of my co-workers, here is some of the feedback. Complete Clean saved my area rug that I thought I would have to spend thousands of dollars to replace, yet Complete Clean was able to restore my area rug at a reasonable price and my area rug looks new again. Complete Clean is extremely knowledgeable with reasonable rates. The work speaks volumes for the company." "I had Complete Clean come out to my house to clean my upstairs carpet which had a big pet stain that kept coming back after other carpet cleaning companies tried to get it out. The stain would disappear but reappear by the following week. I was getting really tired of throwing my money away. I was getting to the point of replacing my carpet. Eric convinced me to give it one more try. I am so glad I did. Complete Clean not only got the stain out but it has not came back after nearly a year. I was so happy with results and that I don't have to spend thousands on new flooring. Thank You Complete Clean." "Complete Clean got me out of a real though jam. I had put a rescue lab mix in the bedroom and closed the door and it rained that night little did I know the poor dog was terrified of the thunder and completely shredded my carpet trying to get out. Worse part the landlord was doing a walk through the following afternoon. Eric came out and work his magic and repaired my carpet to point that the landlord couldn't even see the repair that was done, best part I didn't have to forfeit my deposit. Now I got Complete Clean saved in my phone contacts. Thanks to Complete Clean." 5★★★★★ - "My wife decided to get some puppies for my daughters so I unwilling agreed. They made my back room that was all tile their own kennel, the tile floor was full of puppy mess and the smell was almost unbearable. I finally had to do something about it. Complete Clean came out and restored my tile and grout to almost new conditions I was so amazed. I thought I would never get the tile to look like it use to, best part they got that horrible odor out completely. Thanks for giving me back my playroom." "Complete Clean really helped me out. I had a called them for a water damage estimate because I had a real high deductible and I knew I couldn't not afford to pay the normal insurance rates because I had called other companies for estimates. Eric was the only one willing to work with me and my budget and he did not cut any corners. He made sure I got the same treatment as if I were paying the full insurance rates for water remediation work. They were really helpful in explaining to me the whole water remediation process and were real careful with my possessions. I am so relieved that I don't have to worry about having bacteria or mold growing in my house with a wife and two kids in the house that was a huge concern. I am relieved that we have a healthy envoirment to live in. Really appericate your help Eric." "My husband and I decided to put our house on the market our real estate agent mentioned to us to be prepared to give a carpet allowance. We knew our carpets and tile were in rough shape but we really didn't want to lose thousands in the deal. Complete Clean re- stretched all the carpets and did a Deep Restoration Cleaning throughout the whole house, we were so amazed with results. Not one buyer asked for a carpet allowance that was more money back in our pockets. Very pleased with that!"